What the heck is wrong with Hollywood lately? This has been one of the best years for filmmaking in recent memory. But alas! It does not appear as if it was meant to endure. Yesterday word came that a remake of The Karate Kid starring Will Smith's son is in the works, and there's also a redo of Footloose headed our way. 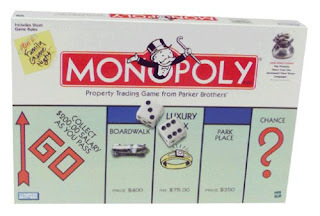 But this next item is something that is certainly... different, in ways most of us weren't expecting: The Hollywood Reporter is breaking the news that a movie based on the board game Monopoly is in development and that none other than Ridley Scott has been attached as producer, and likely will be directing it as well. Scott is looking at the project "with an eye toward giving it a futuristic sheen along the lines of his iconic 'Blade Runner.'" The story also reports that a movie based on Battleship is also being considered (didn't they already make that a few times, first as The Enemy Below and then The Hunt for Red October?). "Do NOT pass Go! Do NOT collect two hundred dollars!" I remember hearing about this one a while back, so it isn't really breaking news to me about this Monopoly movie stuff... It's still just as sad to see it still being planned though. I was hoping they had dropped the idea. Another sign of the impending apocalypse: They are planning on remaking Red Dawn. I mean, come on people! Come up with a freakin original thought!!!! How da heck are they gonna remake Red Dawn?! I mean, the Soviets are no more. What other reds could there possibly be to make a plot out of?!? Maybe they will make Red Dawn as an alternate reality? Where the Soviet Empire increased in strength and never fell apart? Otherwise, I have no clue how on earth they can remake it...it serves as a historical marker of a point in time in US history. I doubt if any of the younger generation would even "get" it. Next thing you know, Hollywood is going to take the list of top 100 movies of all time and start remaking all of the old ones. First up for desecration: Citizen Kane. Ugh.